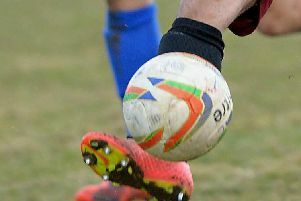 Rugby Town’s hopes of topping the UCL Premier Division and with it promotion out of level five of the non-league pyramid are fading fast after their 4-3 home defeat to Eynesbury at the weekend. Valley threw away a two- goal lead at a gusty Butlin Road - making it five points dropped there now in an eight day period, following on from their 1-1 draw against Pinchbeck the previous Saturday - a result that had ended a six-match winning streak for Carl Adams’s men. Rugby had gone into the Eynesbury fixture ten points adrift of leaders Daventry, and that advantage was extended to 11 after Dav’s 2-2 home draw with Sleaford - whom Town visit this Saturday. Deeping have leapfrogged Valley back into second place after they returned from Wellingborough Whitworth with a win to establish themselves as the more likely challengers to Daventry - although it would take an amazing decline of fortune to see the Northamptonshire club throw away the title now. However, Daventry arguably do have the harder run-in with their season concluding with games against a useful looking Pinchbeck side and the Easter Monday local derby against Rugby, before the final fixture sees them travel to Deeping in what may turn to be a winner-takes-all affair. Rugby’s seven-game finale to their first season in this division sees them face five matches away from Butlin Road - starting with this trip South Lincolnshire to face a side who are currently sitting in 14th spot in the table. Town will go to Eslaforde Park in search of what would be a sixth double of the season, after they comfortably saw off Sleaford 4-0 in the reverse fixture in November, with Danico Johnson, Lewis Rankin, Richard Blythe and Fazel Koriya on target that day. Town boss Adams’s options to change things round following the Eynesbury disappointment are limited by lack of bodies, with Dom Perkins serving the second of his two game ban this weekend and fellow midfielder Richard Bunting still struggling with a groin injury. There may be a switch over of keepers this weekend though, after Rugby conceded four goals in a game for the first time in 40 competitive outings this season. Adams could give Louis Connor a second start in his fourth spell at the club, after the 26-year-old returned to Town in January to challenge regular incumbent Matt Hill for a place between the sticks. Connor’s only other appearance this season came in the 2-2 home draw against Peterborough Northern Star shortly after his signing, although he did enjoy a particularly impressive 2016/17 at the club scooping three player of the year awards in the process. # Rugby’s hopes of pinching a point back on Daventry following last week’s announcement of a withdrawal from the league by Oadby appear to have disappeared following their likely reinstatement after a local businessman stepped in to save them. # Saturday’s coach to Sleaford will leave from outside Rugby School at 11am. and from Butlin Road at 11.15. For latest information, contact Tony Mann on 07970 691366.